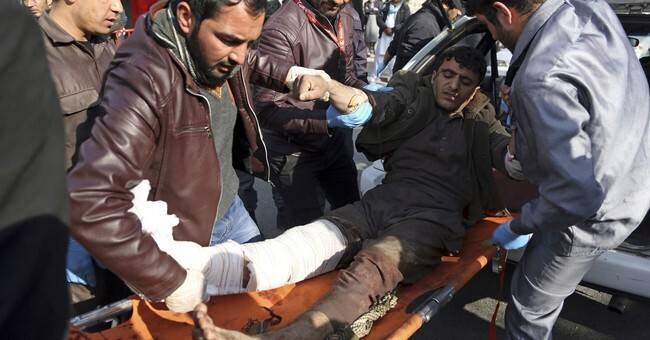 The Taliban attacked innocent civilians and children in the Afghan capital today, killing at least 95 and injuring 158 others. In particularly evil fashion, Taliban militants commandeered an ambulance replete with explosives through a government checkpoint and into a crowd of people in Kabul. The ambulance looked like the typical ones used for medical and health procedures by foreign aid groups. One eye witness spoke to BBC, telling the British based news agency the gruesome details of the attack. “MP Mirwais Yasini told the BBC the area looked like a butcher's afterwards. He was having lunch at his family home, just metres away, when the blast went off. "First of all we thought it was inside our house," he said. Then he went outside and saw scattered bodies. "It is very, very inhumane." to remain anonymous, told the BBC he was about a 1km away when he heard the noise. "I saw a huge flame," he said. "The smoke was pungent. It entered my eyes and I was not able to see for some time." He said when he moved closer he saw the dead bodies, and it looked like a "brutal graveyard". "It was a terrible moment. [The area] is completely destroyed." After the attack was carried out, the Taliban took credit for the tragedy in their latest attempt to overtake the government. Last October, the Taliban killed 176 people in a similar attack in the country. United States President Donald J. Trump and Vice President Mike Pence condemned the attack and offered their support for the Afghan people.